Hey y’all! September has been crazy. I’ve had a whole lot of project startin’ going on, and not much in the way of project finishin’. 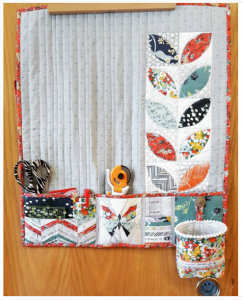 But I did manage to finish one project and I am so happy with how it turned out that I felt it was deserving of a blog post. 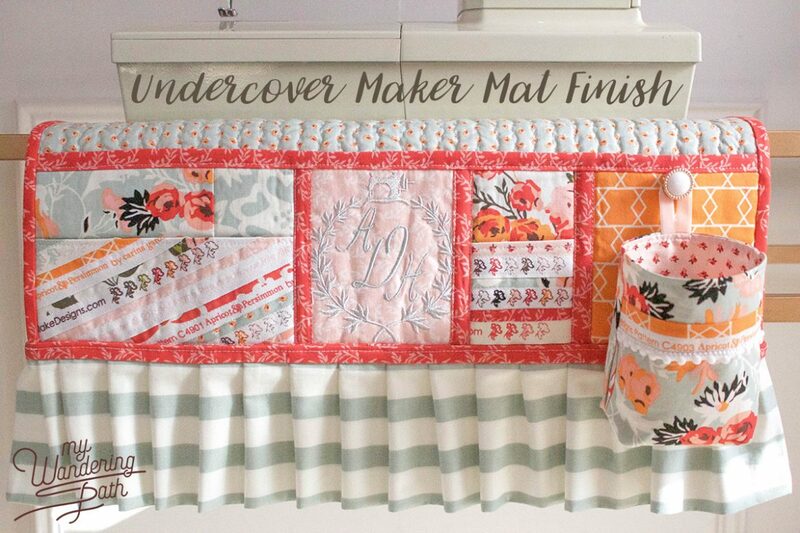 When Nicole of Lillyella Stitchery posted on Instagram about a sew-along for her Undercover Maker Mat earlier this month, I knew it would be the perfect first sew-along for me! I’m finding that I really enjoy making things that are both pretty and functional, and the Undercover Maker Mat is absolutely both of those things. I’d bought a couple of half-yard bundles of Apricot & Persimmon from LouLou’s Fabric Shop a couple of months ago with the intention of making a Carry-All Caddy or two from them. After checking the fabric requirements for both patterns, I realized I had enough to make both a mat and a caddy, and that made my heart sing. 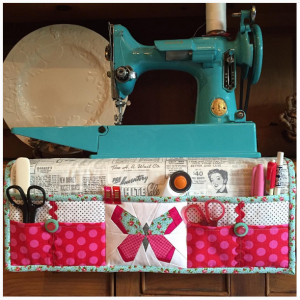 I mean, everyone loves coordinated sewing accouterments…right? 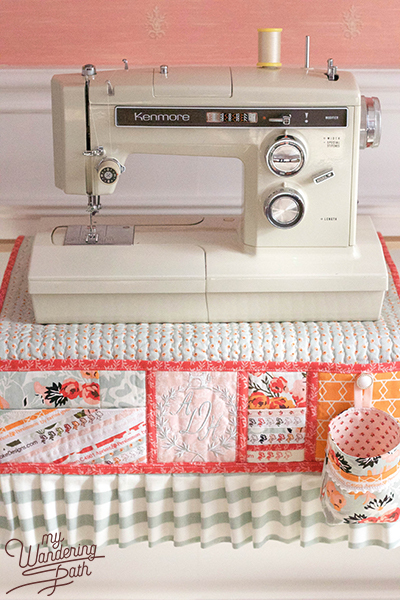 I don’t know how many of you sew on vintage machines (side note: I just learned that my Kenmore Singer—model 1760—dates to 1976-1977. I was born in 1977. So…I think I’d better stop saying “vintage” sewing machine because I don’t like the thought that I am also “vintage.” Hah! 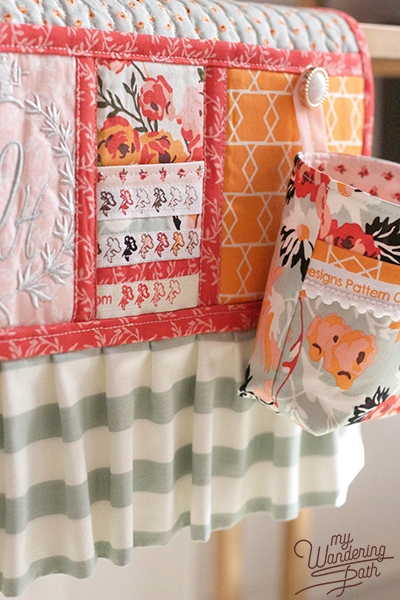 ), but if you do, you already know that decorative stitches are done with pattern cams. 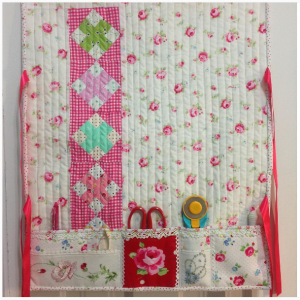 I’m fortunate that the previous owner of my machine had every accessory and kept them in impeccable order, so I was able to quilt my mat with a lovely decorative stitch. I’m so glad that I tried something new! I like feeling as though I’m using my machine to its fullest potential. Bonus: That pretty quilty crinkle without having to wash the mat. 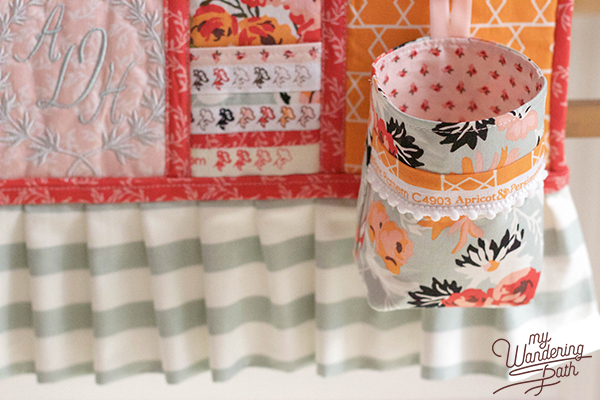 Nicole has a lovely paper pieced butterfly pattern, and I absolutely ooh and ahh over the versions I see on this sew-along, but butterflies aren’t really “me.” Monograms, however…well, I’m a Southern girl, and we monogram things. 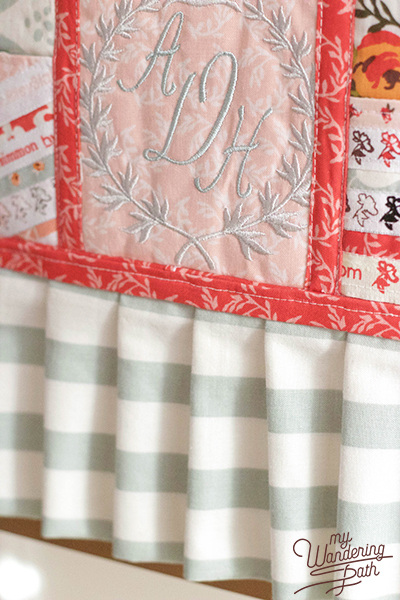 Plus, I’m always looking for an excuse to put my embroidery machine to good use! It’s hard to tell in the pictures, but I used a silvery blue-gray thread for my initials and a silver-grey for the monogram wreath. 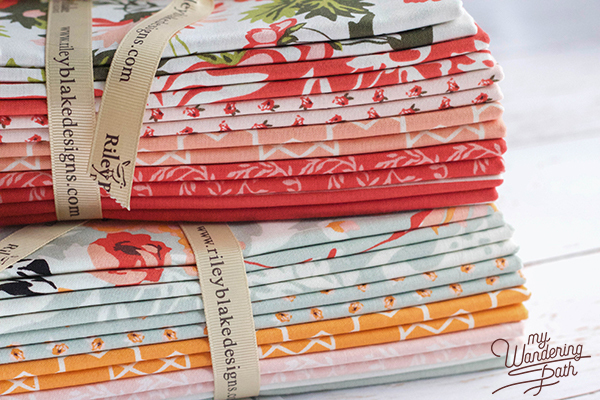 Although Apricot & Persimmon has some modern elements, the particular prints and colors I chose were shaping up to be pretty feminine. So I decided to just play that up a bit and add a ruffle! I figured it would also be good practice for me, as I’m also in the middle of making a steampunk costume for my daughter—which means I have lots of ruffling ahead of me. 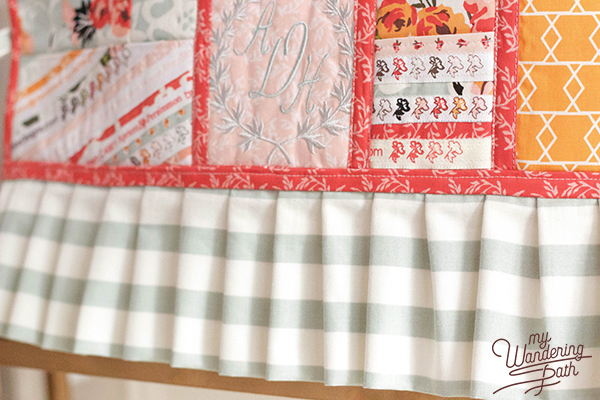 The ruffle is also great because my mat was not going to completely cover my machine. I might have known that in advance if I’d measured my machine, but that seems like something an organized person might do. The ruffle added just enough length to completely cover my machine. Y’all, this ruffle involved way more math than I was prepared to do. I wanted pleats, not gathers, and rather than deciding on a set number and depth of pleats and figuring out how much fabric I’d need, I began with a cut length of fabric and had to figure out how many pleats I could fit in, at what depth, and at how far apart. Did I say earlier that butterflies aren’t really “me”? Well, here’s the exception! 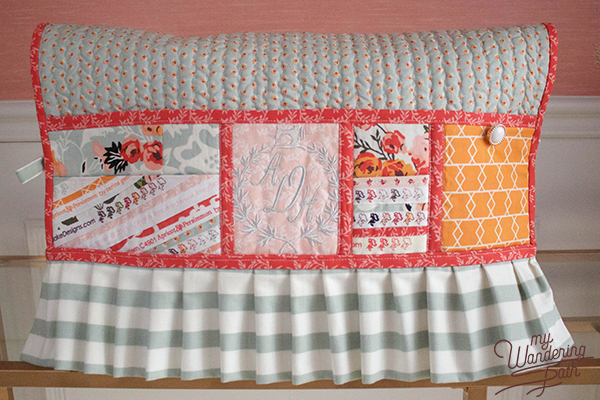 I love how she used the Maribel fabrics. This gorgeous mat jumps out at me every time I scroll through the sew-along hashtag feed! 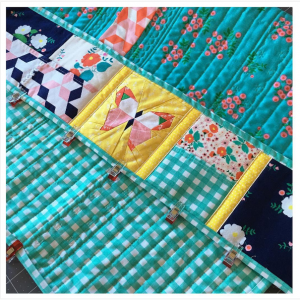 Paper piecing perfection! 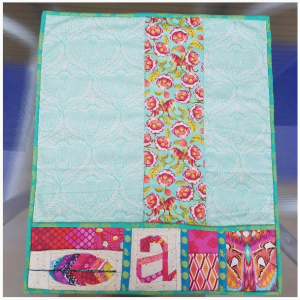 I love the feather and the “a,” and these colors are fab! 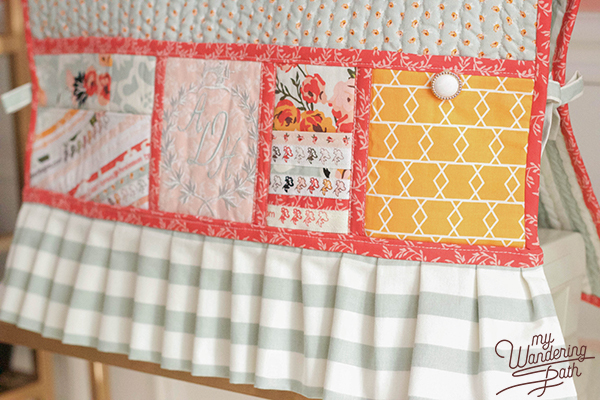 There are so many things to love about this mat: the awesome fabric pull, the petal/orange peel blocks on the body, the super-cool chevron selvedge pocket…major mat envy here! Hey, a sewing machine more vintage than mine! You can’t beat a mat that matches the machine so perfectly. 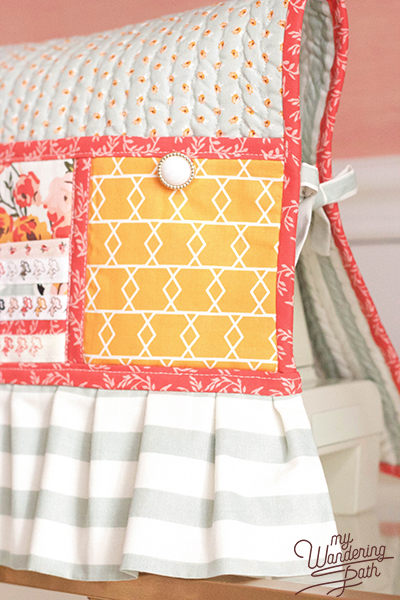 I adore the cheerful fabrics she used, and the rickrack trim is perfect! 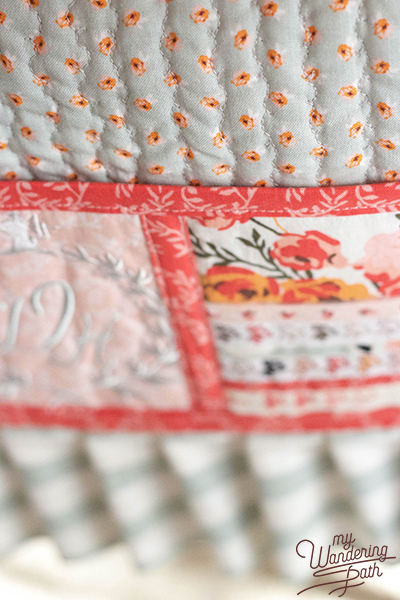 I just love how she incorporated vintage embroidered hankies into her mat pockets. What a sweet and lovely finish! In a sea of ongoing projects, it felt great to start and finish something in just a couple of weeks. Not only that, but it’s something I get to see and use every day. Isn’t that the best? 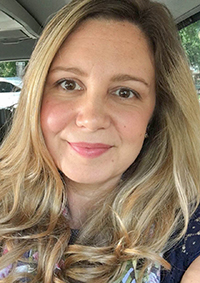 I’m headed to North Carolina today to spend the week with my parents, and I hope that I’ll have some uninterrupted time to finish up a couple more things to share with you here on the blog! Really, really nice! I love the fabric choices and the monogram- the ruffle turned out perfect! Well done!